Despite widespread opposition, Kinder Morgan is still promising to start construction of the Trans Mountain Pipeline expansion in the first part of September. Justin Trudeau is also constantly reaffirming the Federal government’s support for the pipeline. Let’s come together to ensure that it will not be built. There is clear opposition from the indigenous nations whose traditional territories it would cross, and overwhelming evidence that the planet cannot support any more dirty fossil fuel mega-projects. Together, we are putting forward a positive vision for a sustainable future. Together, we will stop this pipeline! 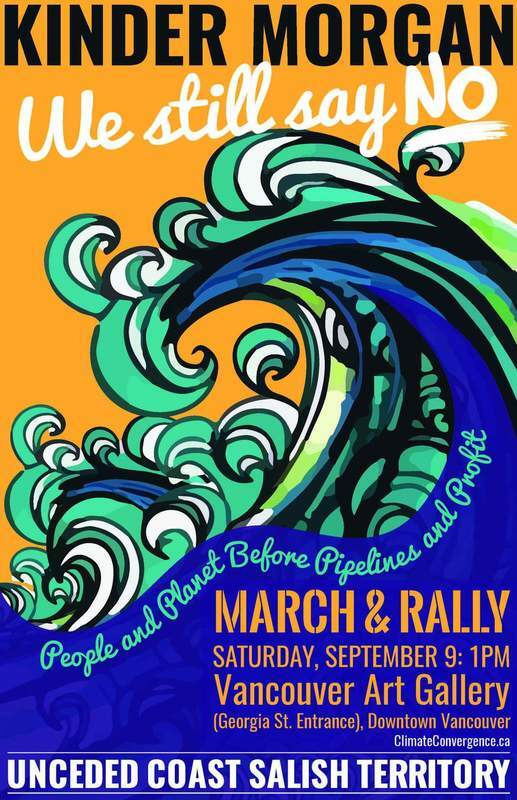 March with us on September 9th as we come together to resist and march for our families, our communities and our planet. Time to march. Time to demand action. Time for common sense. Time to refuse. Time to walk. Time to paddle. Time to vote! Time to SIT DOWN and refuse to contribute to self-centred stupidity. The time is NOW!